When looking for a yard drainage contractor, go with the experience. We have over 30 years of experience. This French drain is along the property line between two homes, they are going to get a new sprinkler system. So we ran the sprinkler pipe underneath the French drain system so that the sprinkler company doesn’t. We don’t want to run the chance of them cutting the filter fabric and compromising our French drain system. 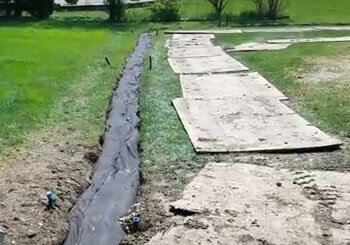 This French drain system runs all the way across the back. They just had a brand new inground swimming pool installed, so this is a great time to correct for the yard water problems. If you’re looking for a yard drainage contractor you want to go with somebody that has the experience has the knowledge to do it right the first time. We went ahead and we cored the side wall of this storm drain catch basin. These storm drain catch basins only take surface water. The water has to come up. To this level and then pour in through the openings. If you want to lower that saturation rate, that spongy soil that you have in the back of your yard you want cord through the side wall, the catch basin. And that way you can drain the water table and you can get the water lower than saturation rate of the soil. Lower it about 14 inches, you’ll be able to mow, the kids can play, the dogs can run around. We went ahead and we ran a feeder plate off the main where there’s going to be three garden boxes. We know they’re going to be watering their vegetables and that’s going to be a real problem so that’s just thinking ahead. When looking for a yard drainage contractor, give us a call at 586-752-2200.